SAINT PAUL, MN, January 13, 2012, Lori Maxfield, Associate Dean for the College of St. Catherine, has been recognized by Elite American Educators for dedication, achievements, and leadership in education administration. Dr. Maxfield is an expert on teacher education, and she also specializes in the area of gifted education. With nearly 30 years of professional experience, Dr. Maxfield shines in her current capacity, as she brings out the best in each and every individual with whom she works on a regular basis. She helps both students and teachers to flourish by growing continually, as she strives to provide a high-quality and interactive learning experience. She is available to professors and students in order to give them the assistance that they need in order to prosper as future leaders. Dr. Maxfield received a Ph.D. in Gifted and Talented Education from the University of Connecticut, and a Master’s Degree in Curriculum and Instruction from the University of Nebraska. She remains abreast of trends and developments in gifted education as a member of Phi Delta Kappa, the National Association of Gifted Children, the American Association of College and Universities, and the National Council of Social Studies Teachers. She supports a number of worthy causes, as well. 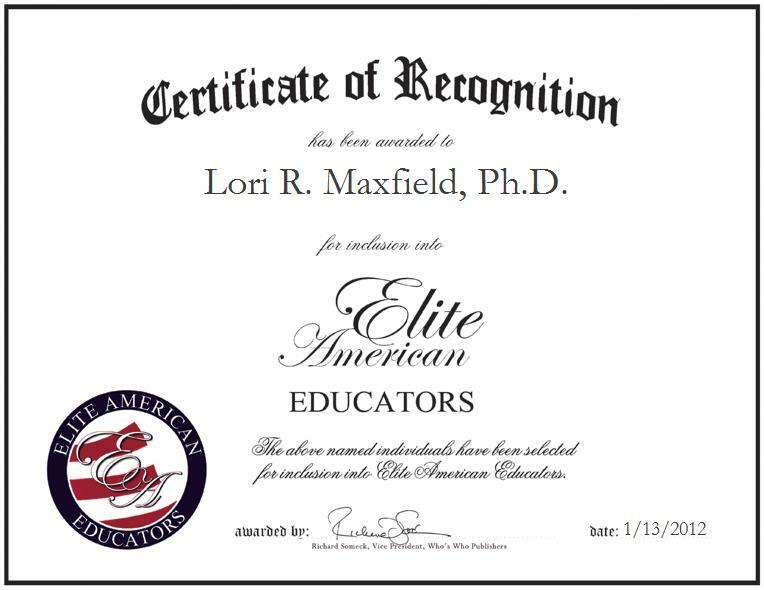 Lori R. Maxfield, Ph.D. was originally selected for inclusion in Elite American Educators in January, 2012. We are proud to be featuring Dr. Maxfield again in Elite American Educators for 2013/2014.